She’s pretending to be a man. Will he see through her disguise in time to prove to her that she’s the right woman for him? Or will a little mischief ruin her second chance for love? My name is Madison Altman. Don’t think because I’ve disguised myself as a man and have accepted a job that takes me away from Earth that I’m running away from love. That’s not true. I met the love of my life--but he was killed on our wedding day. I loved this series and this book. I was looking forward to reading this book so much that I began reading it at midnight after it downloaded. I thought, oh, I'll just read a little and then go to sleep but instead was drawn into the story and sleep suffered. It was worth it though. Enoki is in charge of the different groups of Dakonians and handles the lottery for the mate selection. He once again did not draw a chit that would allow him to choose a mate. Madison's fiance died on their wedding day and she has closed herself off to love. To prove to her brother that Earth is sexist, she applied for a job as a man and as a woman on the ship that transports females to Drakon. Of course the application by a female didn't even get a call for an interview but her application as a man did, along with a job offer. She's been working while disguised as a male which has helped her pay off her bills. Even though Enoki hasn't drawn a chit for a mate, the winds of fate keep whispering that she is there. Madison ends up stranded on the planet and is rescued by Enoki. After that things are a bit humorous. The winds of fate talking to Enoki was a fabulous and integral part of the story as was the weather. That and the connection between Madison and Enoki made this a great read. At the end of the book is a peek at "Darak," which has the Dakonians joining a mating/dating service that will take them to Earth. I read this recently and It is also an enjoyable read. 5.0 out of 5 starsSHE’S HERE! SHE’S HERE! Once again, Cara Bristol has spun an amazing Sci-fi tale. Two planets, each needing something, and working out an exchange program. One is trusting, and the other is devious in how they handle their part of the exchange. Earth or Terra needs the illuvian ore to power things on earth, and Dakon needs females to help populate their planet after an asteroid centuries ago wiped out so many of their people. Along with it came a virus that killed out females, leaving them with only a few, and even fewer children being born. The story will grab you from the beginning to the end and keeps you guessing as unexpected details emerge. 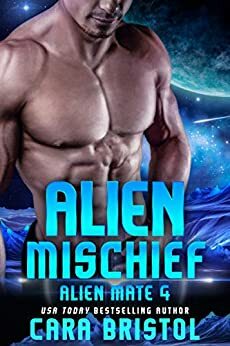 What happens when Madison Altman pretends to be a male to help transport mail-order brides to Dakon and this time gets left behind? Rescued during a blizzard by Enoki, head of the Council of Dakon, it will be a challenge to keep her secret. Why are the Fates telling Enoki his fated mate is here? All the women were claimed? Will the secret remain and Madison return to Earth, or will the truth be revealed and challenged? Will Enoki become angry and believe Madison is playing him for a fool? Are the Fates really that cruel? Madison had love on Earth and lost it when Matt was killed in an accident on the way to their wedding. Because she knows love, she can’t just do what so many other women are doing and become a bride or mate to a stranger. What happens when Enoki tells her they are Fated mates and he is willing to fight and risk everything with his people for her? The story is a journey full of memories, the past, the future with plenty of angst and confusion. Enoki questions the Fates telling him his mate is there—Madison doesn’t believe she will ever find true love again. But the Fates have brought these two together, and it is up to them to fight for their future and happiness. Nothing is more powerful than love and a future of happiness. 5.0 out of 5 starsLove This Series !!! Madison Altman is disguised as a man. This is not for nefarious purposes, but it makes it easier to do her job. Chaperoning women traveling to Dakon to become the mail-order brides of aliens is what she does now to pay the bills. But this time her best friend Garnet signed up for the program and is coming with her on the transport to Dakon! She tried to tell Garnet that Dakon was a primitive, frozen wasteland, an asteroid hit having brought on their current ice age! It was beyond cold! When they arrived, Madison gathered the ladies together to exit the ship. A huge storm was approaching and they had only a small window of opportunity to launch or they would be stuck there. Madison stayed until Garnet’s mate chose her. Then she said goodbye to Garnet and Enoki -- head of the Council of Dakon, the planet’s ruling body, and director of the mate selection process -- and walked toward the ship in blizzard conditions. As she approached, the ship rose from the surface! She had been left behind! They would not return for 7 months! Only then did she remember they replaced her defective translator and probably did not update the computer! She would have been reported as having never left the ship! Enoki was feeling inner turmoil! The whispering voice of Fate that kept saying his mate was here would not silence and urged him to act NOW, but on what? He left for an emergency shelter for the night, but the winds suddenly quieted and he heard a call for help! Fortunately Enoki -- who thinks Madison is a man – found her with a sprained ankle and is prepared to find a way back home for his friend. In the emergency shelter, his horns vibrate with strong emotion. Yet as tense as he is, he is also filled with a sense of calm! He just can’t figure why the whispers of Fate keep telling him not to let his friend return home to Earth? I think this book was the best one of the series! Or maybe it’s just my own crazy sense of humor! The story line was adorable and funny, the characters amazing! The reader will love this humorous discovery of a mate when none seems possible. And if this works and they do find love, Enoki will have an additional gift that Dakonians rarely find – love AND a strong, lasting friendship.